Clinton Foundation amends foreign government donation rules. 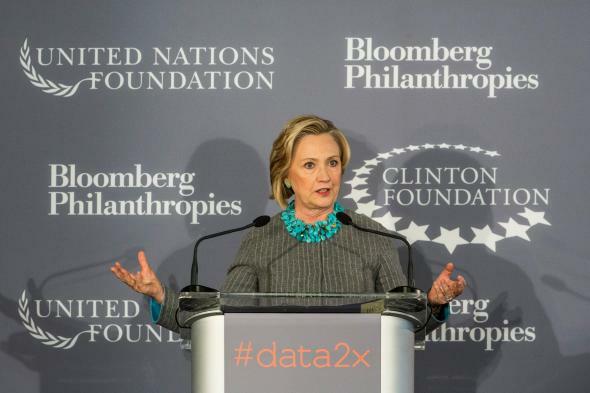 Hillary Clinton announces a new Clinton Foundation initiative on Dec. 2014. The board of the Clinton Foundation decided to amend the its rules on who can donate to the organization, but will still allow select foreign governments to contribute, the Wall Street Journal reports. The changes accompany Hillary Clinton’s departure from the foundation’s board and are aimed at limiting the perception of—as well as an actual conflict of—interest as she mounts her latest presidential bid. Under the new guidelines six countries would still be able to donate to the Clinton Foundation, including: Australia, Canada, Germany, the Netherlands, Norway, and the United Kingdom. Other foreign governments will still have access to the Clinton Global Initiative and can attend other foundation events with attendance fees of $20,000. The foundation’s donor disclosure will also be released with increased frequency—quarterly, rather than yearly. The approved countries are all pretty uncontroversial political allies though, the Journal notes, they still substantially impact American foreign policy from the Keystone XL pipeline to the ongoing Iran nuclear negotiations. The Clinton Foundation has in the past faced criticism for large donations from Saudi Arabia, and others that have questionable human rights records.